Posthumous Imperial Issue of Divus Vespasian, who died on 23 June, 79. Obverse: DIVVS AVGVSTVS VESPATIANVS, laureate head right. Reverse: winged thunderbolt on draped throne (Pulvinar) of Jupiter and Juno. In 107 AD, Trajan demonetized the precious metal coinage. 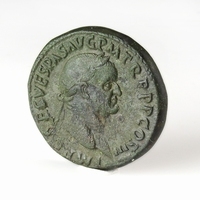 To reassure the Roman public he issued a series of restoration coins which made use of traditional types and designs. This series of denarii and aurei were honoring (among others) Julius Caesar, Augustus, Tiberius, Vespasian and coins of the Civil War. This denarius uses an obverse with a portrait of Vespasian with a reverse of a pulvinar (throne). Jupiter (represented by the thunderbolt) is a fitting symbol for Vespasian who delivered Rome from the horrors of the civil war which followed after Nero's suicide (Year of the Four Emperors).